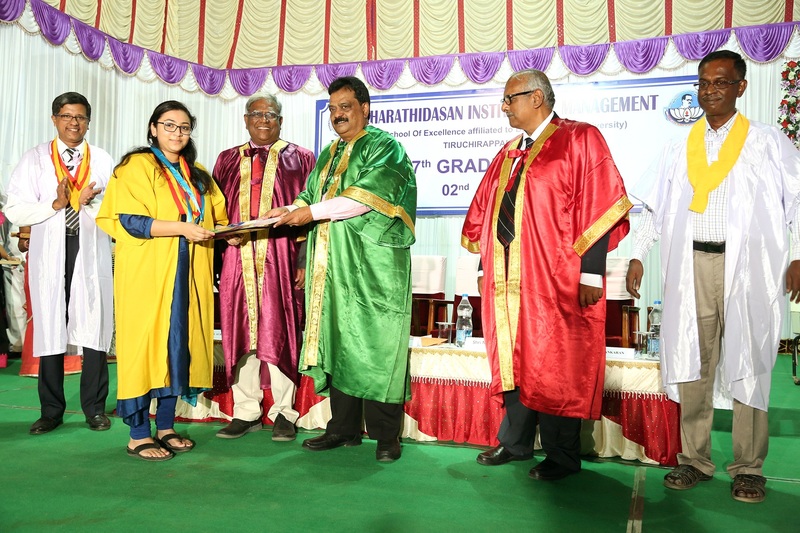 Bharathidasan Institute of Management celebrated its 27th graduation day in MHD Hall, BHEL on Saturday. Bharathidasan Institute of Management launched its MBA program in the year 1984 and has carved a privileged niche for itself in the field of management education as an autonomous B-school affiliated to Bharathidasan University. BIM has been consistently ranked as one of the top business schools in the country and No 1 among the business schools in Tamilnadu in the latest Times of India survey and in A-one category by All India Management Association ratings. Dr. S. Karuthiah Pandian, Director, BIM welcomed the gathering and advised the graduating students to stay humble, be curious, read voraciously and volunteer for hard assignments. He emphasized that excellence is a drive from the inside and it’s not for someone to notice, but for one’s own satisfaction. The event was presided over by Dr.V.M.Muthukumar, the Vice Chancellor of Bharathidasan University. The chief guest inaugurated the event by lighting the lamp. Dr.V.M.Muthukumar highlighted that MBA connects one to the future. He added that learning doesn’t stop with MBA or a PhD but continues throughout one’s life. He ended his speech by giving students the Ten Commandments for success that included striving for excellence, integrity, courage, innovation, empathy, the passion to learn, among others. Sneha Raj N was felicitated the gold medal for her exemplary achievement in academics. Prof.M.Sankaran administered the management oath to the students. The graduation day was for students of batch 2015. 120 graduated from BIM in 2015, of which 119 students from various parts of the country and all over the world came to attend the convocation ceremony. “The Literary Club” of IIM Ranchi – The words of a Literati..